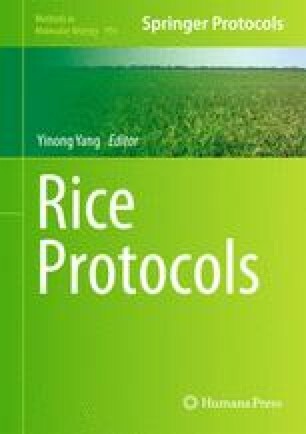 Despite the availability of the finished genome sequence and tools for its analyses, few rice genes have been characterized. Because Agrobacterium-mediated transformation causes random T-DNA insertions across the genome, T-DNA can be a good mutagen for functional genomics. Gene-indexed mutants with flanking sequences around inserted T-DNA are valuable resources for accelerating functional characterizations of rice genes. Such mutant lines, covering at least half the rice genome, have been generated through international efforts. Here, we describe approaches that use functional genomics with T-DNA insertional mutagenesis.